Following its collapse after the pullout of Soviet assistance at the end of the 1980s, the Cuban economy began to make a respectable recovery in the mid- 1990s. That recovery was due largely to a restructuring of the economy which allowed for foreign investment, legalized a limited amount of private economic activity including the agricultural markets, legalized the holding of American dollars, created dollar stores where the money could be spent and encouraged tourism. These were important actions that fundamentally changed both the structure of the economy and to some extent lessened the ability of the Cuban Government to control its own population. The Cuban Government saw the benefits of its actions relatively quickly with reported economic growth of 2.5 percent in 1995 and 7.8 percent in 1996. By 1996, however, the Cuban Government decided the reforms had proceeded far enough. Its reasons are best left for another forum, but coincident with the end of restructuring has been an end to the recovery. In 1997 the economy, according to Cuban governments reports, grew 2.5 percent. 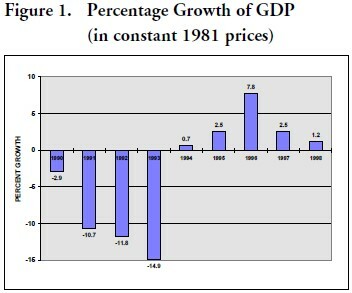 In 1998 growth was only 1.2 percent2 (Figure 1). Tourism continues to be the bright spot in the Cuban economy. Since 1990, the number of visitors has grown at an average of 20.0 percent per year and reached 1.4 million in 1998.3 Revenue grew 11.8 percent in 1997 and 17.7 percent in 1998, reaching a reported 1.8 billion dollars in 1998.4 The growth in hotel space, which slowed in 1997, picked up in 1998 with the addition of 3,506 rooms. Occupancy rates also continued to grow, and in December 1998 Cuban Vice President Lage reported the country was investing 500 million dollars per year in tourism5 (Figure 2). 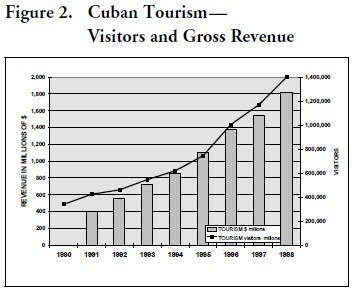 For 1999, Lage reported that the number of visitors grew 23 percent in the first six months as compared to the previous year.6 That increase may not hold up for the rest of the year; the first quarter of 1998 was depressed to some extent by the visit of the Pope, which caused tours to be canceled and the Cuban government to send many tourists home early. In addition, in the opinion of numerous participants in Cuba’s tourist industry, the current crackdown on political opponents and economic crimes has caused a serious decline in tourism in Havana. The move against prostitution started in November and soon became a campaign to discourage all types of contact with foreigners especially on the part of young Cubans. The result has been an apparent dramatic fall in tourism in Havana in recent months. Although no hard statistics are available, one restaurant reported in May that business was down 42 percent from the previous year. A major hotel operator reported that his hotel was at only 20 percent occupancy, again much lower than the previous year. At the same time, the beach resorts were reported still full. With a lack of statistics on the division of tourism between the beach areas and Havana, it is not possible to fully estimate the impact of the tourist drop off in Havana. For the long term, the prospects for the tourist industry continue to look good although there are reasons to believe the high rate of growth will eventually slow. In 1996 the Caribbean, excluding Puerto Rico and Mexico, received 8.6 million tourists.7 Cancún now receives tens of millions of tourists annually. Cuba has not yet developed the infrastructure of Cancún. Return tourism is attracted more by cheap prices than excellent service or shopping, but the market is huge and Cuba has just begun to touch it. On the other hand, interviews with many businessmen in Havana suggest that profit margins are slim and the return to investors is not great. Cuba is not a cheap place to operate for the foreign investor in part because of the conditions the government places on joint ventures. This may eventually place an economic brake on the current expansion, at least in terms of foreign investment. There is also reason to believe that the government is having its own trouble meeting foreign exchange obligations which could cause it to divert funds from investment in tourism. At this point such possibilities are still more speculation than prediction, but it will be an area to watch in the future. 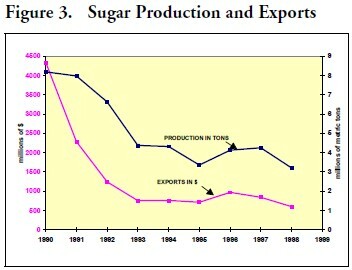 Following the smallest crop in 50 years in the 1997/ 98 season, sugar production rose in 1998/99. The steep decline in sugar prices in the last year, however, will probably leave this year’s gross revenues less than last year’s. Total production in 1997/98 was between 3.1 and 3.2 million metric tons, while exports are believed to have reached 2.4 million tons.8 For the 1998/99 season, the Cuban government is reporting production in the order of 3.6 million tons. Exports should be between 2.8 and 2.9 million tons. The Cuban government has been remarkably silent about actual earnings from either sugar crop, but reasonable estimates would put gross revenue for the 1997/98 crop in the 540-600 million dollar range, and in the 460-540 million dollar range for 1998/99 (Figure 3). The reasons for the steady decline of the Cuban sugar industry are well known. Four decades of decapitalization, centralized decision making, lack of incentives or often the wrong incentives, and the structuring of the industry around almost-free Soviet oil have left an industry that needs both reorganization and recapitalization. Output in 1997/98 fell in part because of a decision not to cut young cane in order to meet production goals ordained from the central authorities. Even so, a rainy harvest season, serious deficiencies in many sugar mills and a lack of incentives for the cane cutters meant the industry had trouble cutting what little cane there was. Looking ahead, it is hard to be optimistic about the industry. Further mill closures, greater decentralization and better price incentives are all steps in the right direction, but the industry may well be beyond the point-of-repair at least under the current economic system. The industry is chronically short of inputs and the foreign loans necessary to finance inputs are not likely to materialize in sufficient quantity. 10 The sugar refineries are in need of major renovation for which there is no capital. The Cuban government has left open the possibility of foreign investment in the sugar refineries, but it is doubtful any company would want to invest in the refineries unless it also had control of sugar production around the plant. The Cuban government has shown little interest in giving up such control. One Cuban source familiar with the industry’s problems told the author that there have been at least a dozen Cuban government studies that have shown that the land under sugar cultivation would be more profitably utilized to grow vegetables or raise cattle. Cuba continues to increase its nickel production at a respectable rate. Official statistics claim a 9.9 percent increase in 1998, but otherwise the Cuban media has been conspicuously silent on the industry for the past year. No information on nickel revenues for 1998 has been published, nor have any estimates been given for 1999. Based on some very limited information from statements of Cuban officials, the author estimates gross revenue for 1998 at about 400 million dollars, down 16 million from the previous year.11 It may be much lower. There is little information on the profitability or hard currency earnings of the industry. Sherritt International is supposed to have recently reported its nickel operations in Cuba had no profits in the first quarter.12 Sherritt is widely, although not universally, believed to be the most cost efficient nickel producer in Cuba and its problems are not a good sign for the rest of the Cuban nickel industry. 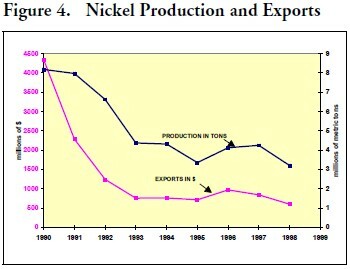 World-wide the nickel industry is suffering because of low prices (Figure 4). After remittances, tourism, sugar and nickel, tobacco—and particularly cigars—is Cuba’s next largest earner of foreign exchange although still much smaller in terms of gross earnings. 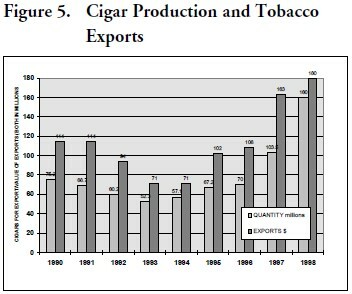 Foreign exchange earnings grew from 160 to 180 million dollars in 1998 while exports grew from 103 million cigars to 160 million13 (Figure 5). Cuba is making a major effort to take advantage of the current popularity of cigars and increase its production. The great bulk of tobacco is grown by private farmers within government-supervised cooperatives. In recent years the government has encouraged a back-to-the-farm movement and has been giving campesinos land in usufruct to produce tobacco and coffee. New brands have been created and the range of tobacco-growing areas throughout the country has been expanded. Cigar experts report the rapid expansion has led to a degradation of quality control and a huge black market in cigars, both those of first and second quality, so that it is now difficult to know what is what. Even so, the demand for Cuban cigars is so great that the quality problem is not likely to affect sales in the near future. The latest Central Bank Report claims a 5.8 percent increase in the total volume of the fish catch, to 144.1 million tons. 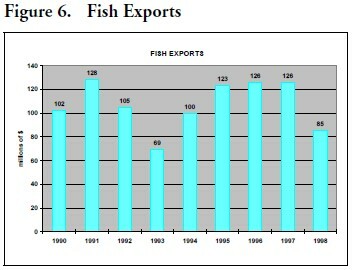 The total is not broken down further except to report that the catch of lobster tails was up 39.8 percent.15 Total exports for 1998 are not reported, but earlier in the year Opciones reported dollar exports for 1998 had dropped 50 million due to the Asian economic crisis and depressed prices16 (Figure 6). The Opciones article also refers to the difficult financial situation of the industry in 1998 and the need for loans costing 12-18 percent. One of the most successful of the Cuban economic reforms of the early 1990s was the reduction of the budget deficit. 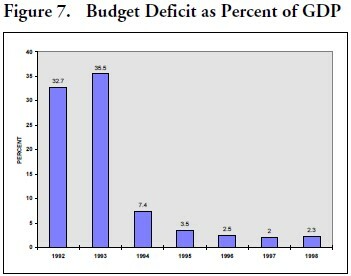 From a high of 33.5 percent of GDP in 1993 the deficit dropped steadily to a low of 2.0 percent of GDP in 1997. It rose to 2.3 percent in 1998 and is expected to rise again to a still respectable 3.0 percent in 199919 (Figure 7). The total peso budget, and particularly the measure of the deficit, is however probably a reasonably reliable number. It is supported by both the reported money supply statistics and a lack of any significant inflation. 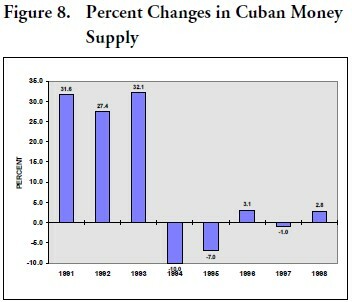 According to the latest Central Bank report, the Cuban money supply—essentially M1—increased by 2.8 percent in 1998. Its two components are: (1) money in the hands of the public, which grew 268 million pesos or 6.7 percent; and (2) savings accounts, which showed no change. The Central Bank does not report on the supply of the convertible peso, which is likely to be held by the public in relatively important quantities in the form of coins for transaction balances. The Cuban government was clever when it legalized the holdings of dollars. To handle change and small transactions, it created the convertible peso both in bills and coinage. This they exchanged for pesos, presumably at the then-existent parallel rate. The result was a decrease in the supply of ordinary pesos— which fell by almost 800 million pesos between 1993 and 199521 (Figure 8). If the Cuban government needed to increase money creation without putting immediate pressure on the prices of non-traded goods, they could presumably print or mint additional convertible pesos. If done in excess, such money creation would eventually affect prices and cause a divergence between the price of dollars and the convertible peso. So far, however, the new peso remains fully convertible within Cuba and there is little obvious pressure on prices. After a 1.9 percent rate of inflation in 1997, prices went up 2.9 percent in 1998, according to the Central Bank. Food prices have been largely unchanged. 22 Hidden inflation (in terms of increasing shortages) also does not appear to have increased this year, at least in terms of food products in the farmers’ markets or in the ration cards. Shortages certainly exist, but do not appear to have increased over the last 12-18 months. Prices and shortages in dollar stores have not, to the author’s knowledge, been surveyed and price inflation could appear in those areas before it would be seen in the domestic food markets. For 1999, the budget deficit is projected to be 3.0 percent of GDP. This is still a reasonable number, but the upward trend is one the Cuban authorities need to watch carefully. More worrisome are the new wage increases for the police and teachers and also for an increasing number of other government employees. It has been reported that an average wage increase of 30 percent will be granted to at least half of all government workers in 1999. Based on a government- reported wage bill for 1998 of 2600 million pesos, such a wage increase will cost the government 390 million pesos annually.23 Although the new wage increase would not be fully annualized in 1999, one can add its impact to the projected budget deficit of 720 million for 1999 to calculate a new deficit of 1110 million pesos, or 4.6 percent of GDP.24 Unless the new salary increases are offset elsewhere in the budget, they will likely generate new inflationary pressures in the rest of 1999 and beyond. In many ways, a much more important number than unemployment, however measured, is total employment as a percent of the population. In 1996, only 45 percent of the Cuban population age twenty and over was employed; a comparable figure for the United States would be 70 percent. On the surface this is not an exceptionally low number for Cuba. In 1985 and 1987, the figure was 53 percent; in 1979 it was 50 percent, and in 1975 it was the same as 1996, 45 percent. There is, however, a qualitative difference in these numbers as well. In the earlier periods, pensions were relatively high compared to wages and, with generous Soviet subsidies, it was possible to lead a relatively comfortable life on a pension at least when measured against the diminished expectations of post-1960 Cuba. Today, with most pensions under 100 pesos per month, retirement is not an option for most Cubans, and persons of any age are willing to work, but see no sense in working for government-imposed salaries. There is now a huge informal economy that in many ways may exceed the formal economy. Unfortunately, much of that economy is illegal and the situation creates a lack of respect for law that will seriously affect the Cuban society for years to come. 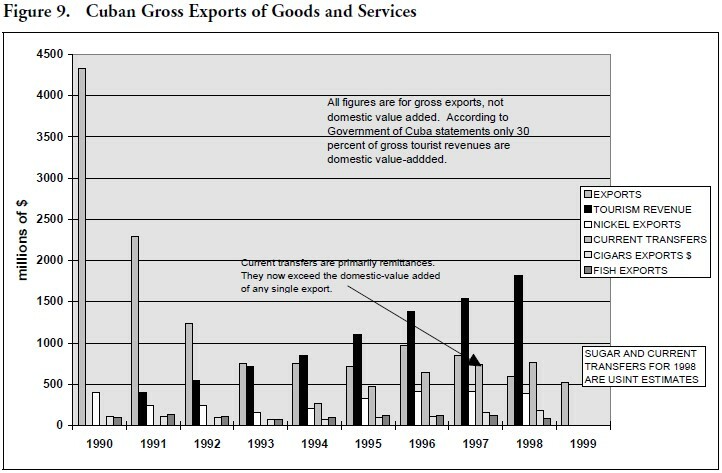 The Current Account After a big fall following the withdrawal of Soviet assistance, Cuban exports recovered somewhat in 1994 and 1996. Starting in 1997, merchandise exports began a decline primarily because of the fall in sugar production and the decline in prices for nickel and sugar. In 1998, that decline was a sharp 20.7 percent, or 379 million dollars. That decline is likely to continue in 1999. Total exports of goods and net nonfactor services, however, have continued to rise— although at a somewhat slower rate—due to the rapid growth of gross tourist revenues27 (Figures 9 and 10). Current transfers have continued to grow, although at a much slower pace. There remain some question as to what percentage of these transfers are remittances, but they almost certainly constitute the larger part.29 On a net basis, transfers are Cuba’s largest source of foreign exchange. After several years of showing virtually no movement, factor services rose by over 100 million dollars in 1998 to a negative 599.2 million. The Central Bank report attributes this to interest payments, interest recapitalization and repatriated profits. With foreign debt also rising, the increase in interest payments rents is not surprising. Harder to explain is why the category had not risen before 1998. The Central Bank report for 1998 revised its estimate of the 1997 current account deficit upward, from 249.5 to 436.7 million dollars. Most of the change came from higher-than-previously-reported imports. For 1998, the current account was reported to have declined to 396.3 million dollars. In recent years Cuba’s current account deficit has been relatively small in terms of either GDP or total exports of goods and net non-factor services. The limiting factor has been availability of foreign capital inflows. Direct investment flows declined by 53 percent in 1998, to 206.6 million dollars. In recent years, investment flows into Cuba have been erratic and a one year decline should not in itself be considered a trend. However, the author’s own discussions with foreign businessmen indicate considerable discouragement with the opportunities for new investment outside of the hotel industry. Cuban authorities do not seem to want much new foreign investment at the moment except in limited areas and on their own, often unacceptable, terms. Negotiations for new investments generally take several years, with negotiators—whose negotiating authority is limited —often changing. In the end, many negotiations never succeed. There has been a lot of publicity lately of the Canadian firm whose proposal was rejected by the Cuban government; the Cuban government reportedly then took this firm’s plans and tried to use them to negotiate a better deal with other foreign companies.30 In Havana, however, one hears of even worse stories. Even within the tourist industry, the most consistent report heard from businessmen is that the return on investment is very low. The cost of hotel construction is high, with pilfering of construction materials often doubling that part of the cost. Construction can also be lengthy. The recently-finished Golden Tulip Hotel took almost five years to complete. In joint ventures the risks are not shared equally. It is becoming standard practice for the foreign partner to put up 50 percent of the equity and lend the Cuban government another 35 percent for its equity share. Land contributed by the Cuban government counts as the government’s additional 15 percent of equity. Although wage rates are very low in Cuba, labor costs are high. Joint ventures have to pay several hundred dollars a month to the Cuban government for each employee. Since many responsible employers are not prepared to see their employees only receive the standard ten to twenty dollar a month wage, they must then pay their employees a second time directly. Productivity is generally not very high, primarily because an atmosphere of service and elegance is still far from the common experience of most Cubans, although many are learning quickly. Theft is widespread and costly. The need to buy many services from government corporations also adds to costs. On the demand side, Cuba has to compete in the very competitive Caribbean market. Package tour rates are very low and the profit per tour visit cannot be very high. Judged by the author’s discussions in Havana, hotel management may still be profitable, but for new investors the profit margins in the industry appear thin. In sum, barring the surprise of a major project, the prospect for a major increase in foreign investment in the next few years seems small. This year, the Central Bank changed the way it reported long- and short-term capital inflows, making comparisons with 1996 and earlier years very difficult. Long-term capital inflows other than direct investment increased from 344.9 million dollars in 1997 to 426.1 million in 1998. Short-term capital outflows decreased from 329.5 million dollars to 219.4 million. One should not, however, draw too many conclusions from the separate numbers since it may be that much of the changes were really the conversion of short-term debt to long-term debt. Cuba has clearly had trouble paying much of its short-term debt in the past year, and several governments that either provided or guaranteed credit rolled them over or converted them to long-term debt. A similar phenomenon has occurred with commercial bank debt over the past several years. The rule in Cuba today is that once a loan is made it stays. The lender if he is large and important, makes his money on the interest payments, which at a current rate of 15-24 percent allow for a generous repayment over relatively few years. Combining long- and short-term capital, the net inflow into Cuba in 1998 was 206.7 million dollars, compared to 15.4 million in 1997 and 92.3 million in 1996. Judging again from comments by the business and diplomatic communities in Havana, it would appear unlikely that much of that came from private financial institutions, except for a few that specialize in providing credit to third world countries at high rates of interest. Looking ahead, a similar pattern is likely to continue. Can Cuba Continue to Service its Debt? In June and July 1999, there was a flurry of reports that Cuba might have difficulty servicing its commercial payment commitments.31 However, casual survey by the author in June of the foreign business community found that Cuba was paying its usual suppliers albeit with occasionally longer delays. Foreign bankers also reported their loans were being paid, although with the usual caveat that the money was then being relent. 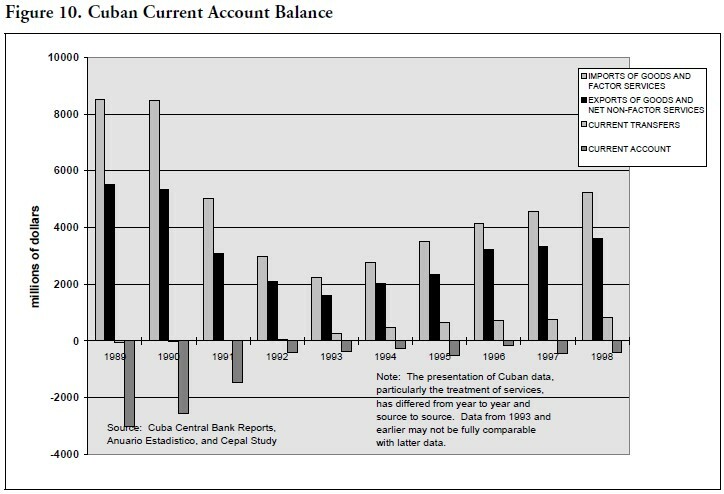 Leaving aside pre-1992 debt, most of which is in default, Cuba’s accumulated current account deficit from 1992 to 1998 is 2,768 million dollars. If, for illustrative purposes, one assumes an average 15 percent interest rate and no repayment of principal, the debt service on this accumulated debt would be about 415 million per year. Cuba’s gross foreign exchange earnings in 1998 (the sum of exports, net non-factor services and current transfers) were 4,416 million dollars. Thus, the calculated debt service to foreign exchange earnings ratio of 9.3 percent is relatively low for most third world countries and, by itself, does not present a problem for the Cuban government to pay. As noted earlier, the Cuban government is already reporting payments for factor services at a somewhat higher rate. This paper has not discussed the Cuban Government’s current campaign to perfect state enterprises. This is primarily because the author has little faith the campaign will succeed. However, it would not be fair to ignore the obvious efforts of many government officials to increase the efficiency of the Cuban economy. In efficiency terms, Cuba starts from a very low base. Its previous attempts to run the economy through centralized planning, and its dependence on Soviet aid, left it ill prepared for the current situation. Although the government has not accepted the principle of a free market economy, it has introduced some incentives and has accepted the basic principle of accounting. It is also trying to adjust basic economic relationships to the new realities, particularly the fact that oil is no longer free. Cuba today is still well within its production possibility frontier, but even without a free market economy it should through sheer-force-of-will move closer to its outer limits. This should not be viewed as sustained growth. Rather it is simply a leap from one inefficient point to a slightly more efficient one. Nevertheless, the process will take several more years and will, ceteris paribus, lead to some growth. In addition, some long-term growth may come from tourism, but without the U.S. market it is unlikely to be an engine that brings prosperity or even rapid overall growth in the near term. The industry will require considerable capital investment, generates relatively little employment for an economy the size of Cuba, and, absent a further economic opening, is unlikely to generate significant collateral industry. Aside from those two areas and absent any further policy changes by Cuban authorities, it is hard to see any other engine of growth. For reasons already explained, significant new foreign investment is unlikely, and there is little likelihood of major capital inflows. If unleashed, there is significant potential for Cuban agriculture and domestic services to grow, but so far there is little evidence the Cuban authorities will move in that direction. In sum, one should expect that if commodity prices allow, Cuba over the next few years may continue to report modest growth. That growth will, however, continue to slow and in any event may not be enough to overcome the depreciation of real assets throughout the still-neglected sectors of the society. It will remain a country dominated by international commodity prices with the consequent cyclical movements in income. Long-term sustained growth will only come with further policy reform. 3. Oficina Nacional de Estadísticas, Compendio de Estadísticas del Turismo: Cuba 1994-1996 (May 1998). 4. All statistics in this report are from the Banco Central de Cuba, Informe Económico 1998, unless otherwise noted. 5. “Los resultados de 1998 son positives y confirman la tendencia a la recuperación económica,” Granma (December 23, 1998). 6. Granma International (July 11, 1999). 7. Oficina Nacional de Estadísticas, Compendio de Estadísticas del Turismo: Cuba 1994-1996, p. 26. 8. Throughout the paper, tons are metric tons unless otherwise specified. 9. The more likely explanation is the use of constant 1981 prices in calculating GDP growth as discussed above. 10. Previously reported material in various Cuban Central Bank reports suggests that outstanding foreign loans to the industry may total over 600 million dollars, or more than the value of the 1998/99 crop. 11. Havana Radio reported on January 5, 1999 that the decrease in international nickel prices had resulted in 60 million dollars in lost revenue. At the same time it reported production increased 12 percent in 1998 over 1997. 12. At the time of writing the author had not seen the original report. 13. Granma Internet Edition (December 31, 1998). Dollar exports include other tobacco products and may also include revenue from Cuban government-owned cigar stores in other countries. Actual cigar production grew from 215 to 263 million in the same period, according to Informe Económico 1998, but Opciones in its issue of February 14, 1999 reported production of 160 million cigars with 126 million sold, for a total revenue of 170 million dollars. The differences probably come from confusion between production for export and domestic consumption, but it is possible that Cuba had a large inventory of unsold cigars at year end. 14. A foreign expert with close ties to the industry told the author that if inputs to the industry were properly priced, the industry would be losing money. 15. Informe Económico 1998, p. 15. 16. Opciones (January 31, 1999). Similar data was also reported in Granma (January 27, 1999). Opciones reports export income fell 50 million dollars, but also reports exports at 85 million dollars. Exports for 1997, however, were reported at 126 million in the Informe Económico 1997, leaving an unexplained discrepancy of 10 million dollars. 17. Informe Económico 1998, p. 15. 18. Informe Económico 1998, p. 16. 19. Anuario Estadístico de Cuba 1996 and Informe Económico 1998. 20. Anuario Estadístico de Cuba 1996, p. 145. 21. There may have been other factors which also allowed for a decrease in the peso supply. However, the Cuban government has very limited instruments of monetary policy. Savings deposits barely changed. The budget remained in deficit during this period, although the deficit was reduced. Cuban foreign exchange reserves are believed to have been very low following the cessation of Soviet assistance and hard currency borrowing was also limited. 22. Casual observations by the author during his stay in Havana. In 1997 and the first half of 1998, food prices fluctuated seasonally and with climactic changes, but with little upward trend. 24. Asamblea Nacional del Poder Popular, Proyecto Ley de Presupuesto del Estado para 1999, p. 5. 25. According to the Informe Económico 1997, 75,000 jobs were reported to have been created in 1997. 26. Total employment in 1998 was 3,626,700 in 1996, according to the Anuario Estadístico de Cuba 1996, p.109. 27. The Central Bank only reports net services and does not provide a breakdown between the export and import of services. 28. The author estimates the savings at between 300-400 million dollars. 29. Ernesto F. Betancourt questions the estimates of remittances flows based on the demographics of the donor community in the United States. “A Background Report on Castro’s Remittances: Scam, Drugs and Money Laundering,” unpublished paper (May 7, 1999). 30. “For Jilted Engineers from Canada, Cuba Wasn’t a Cheap Date,” The Wall Street Journal (June 28, 1999). 31. The reports apparently started from a leaked paper, allegedly prepared by the French Embassy in Havana, that expressed concern with Cuba’s ability to pay. A well-publicized threat by an UK bank to declare default if Cuba did not make a payment of 2 million dollars on a 14 million dollar loan also added to speculation. In the end Cuba made the payment. 32. This does not mean all suppliers will be paid. Credit institutions will continue to have to roll over the bulk of their loans. Foreign governments that wish to extend export credits for mercantile or foreign policy reasons will have to reschedule their debts. Smaller suppliers will continue to make one or two shipments on credit, only to find their Cuban partners will find another supplier and neglect to pay them. All the above, however, has become standard operating practice in Cuba and seems unlikely to change in the near future.